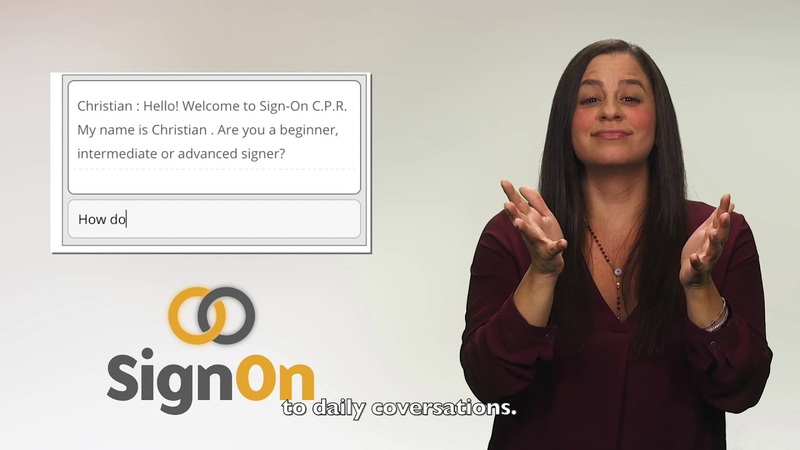 SignOn was created out of necessity since there was a jarring gap in the acquisition of American Sign Language (ASL) and understanding of Deaf Culture. What was missing within this gap? True ASL immersion! SignOn— a “Virtual Immersion Program”—connects the hearing and Deaf communities through an authentic learning immersion interaction. Through our program, ASL learners have the unique opportunity to communicate one-on-one with a Deaf ASL Ambassador. Who actually uses ASL as their primary language. SignOn gives learners the confidence that they need to engage with the Deaf Community. Allowing them to connect, practicing and retaining crucial American Sign Language techniques. Who are taking American Sign Language coursework. As well as the friends and family members. As well as anyone who is trying to learn how to communicate with a family member who is Deaf. The live and structured interactive connection between a Deaf individual (our Deaf ASL Ambassador) and an ASL learner (student, parent, interpreter trainee, etc…) is an experience that is unique to SignOn. The ASL learners have access to live 30-minute sessions with our Deaf ASL Ambassadors. Their primary mission is to help the learner practice and retain their signing skills. During their live 30-minute sessions, users can personalize their experience—choosing to practice everything from basic vocabulary to daily conversation. These sessions can be scheduled at the learner’s convenience. Even done from virtually anywhere and are completely personalized to the skills of the learner. By engaging the Deaf community in the ASL learning process. Therefore the Deaf are able to help shape and form the way ASL is taught and understood by the learner. This gives them the opportunity to spread awareness of Deaf culture. They are the ones who actually use ASL as their language. Their practical knowledge is far more beneficial and immersive than the average textbook. This allows them to better help individuals learn ASL. They can also add an extra level of support to those who are newly deaf and new to the language. including the deaf in the learning and teaching process. Therefore allowing them to create higher quality interpreters for themselves and future generations. SignOn connects the hearing and Deaf communities through authentic virtual learning interactions. Therefore giving American Sign Language learners the unique opportunity to communicate one-on-one with a Deaf ASL Ambassador. Users connect with their Deaf ASL Ambassador via a two-way video portal on our proprietary, Web-based platform. SignOn is available to anyone with a sincere interest in improving their American Sign Language ability. We strive to serve a wide variety of individuals, including students in grades K-12. Students that are learning college level ASL material and the family members, friends and colleagues of Deaf individuals. We also work with companies that have a desire to better communicate with the Deaf Community. Our goal is trifold: We provide learners virtual access to the Deaf in order to immerse in ASL and culture. To actively engage the Deaf in the ASL learning process. As well as employ the Deaf utilizing their American Sign Language skills. Reach out to us any time. Contact us! Become A Part Of The SignOn Community Today!